The African Wild Dog is locally extinct in many African countries and is listed as endangered across the entire continent. Here are a few reasons we think this remarkable predator is important and a list of the ways you can help protect this unique species through a placement with African Conservation Experience. Wild dogs are the most endangered carnivore species in southern Africa. The African wild dog (Lycaon pictus) has been in overall decline across Africa for decades. Viewed as a threat by livestock farmers and highly susceptible to many diseases carried by domestic dogs, their numbers have fallen dramatically across much of their historical ranges, which have also been substantially reduced and fragmented. Official estimates vary, but most place the number of individuals remaining in the wild at around 6500 animals, while some estimates put the number much lower. This means that African Wild Dog populations currently stand at less than 1% of their peak numbers, making them the most endangered carnivore in the region. In Southern Africa, though, there are two great wild dog success stories, both of which you can visit through our programs. The first is Botswana, with roughly 500 individuals remaining in the wild, and the second is South Africa and the Kruger National Park in particular, which is home to close to 250 individuals. Wild dog on the hunt – these beautiful animals enjoy an exceptional success rate due to their high levels of cooperation. What’s so special about wild dog? 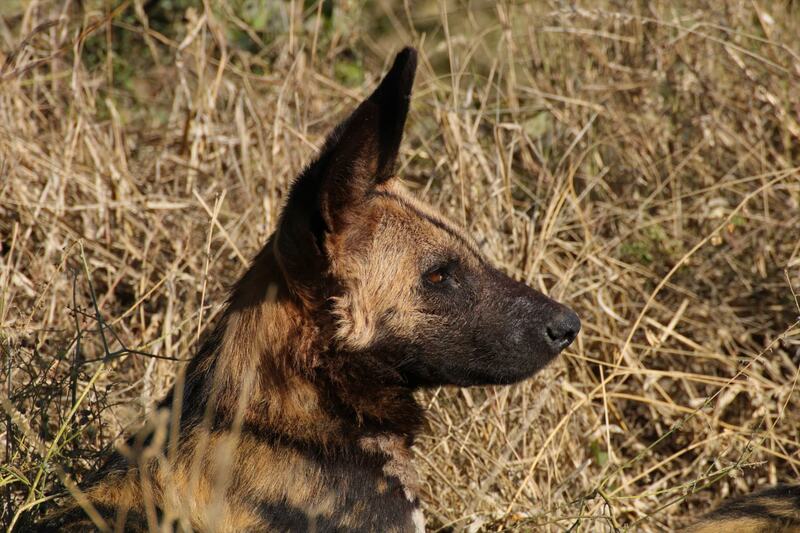 Wild dogs are a fascinating species for a number of reasons. They are distinguished from other Canids (dogs) by having fewer toes and by a special dentition (number and arrangement of teeth) – specially designed for a diet consisting exclusively of meat. They are amazing hunters and the most successful when compared with other large predators. Much of their success is based on the whole pack working together as a team. And that’s only the beginning! 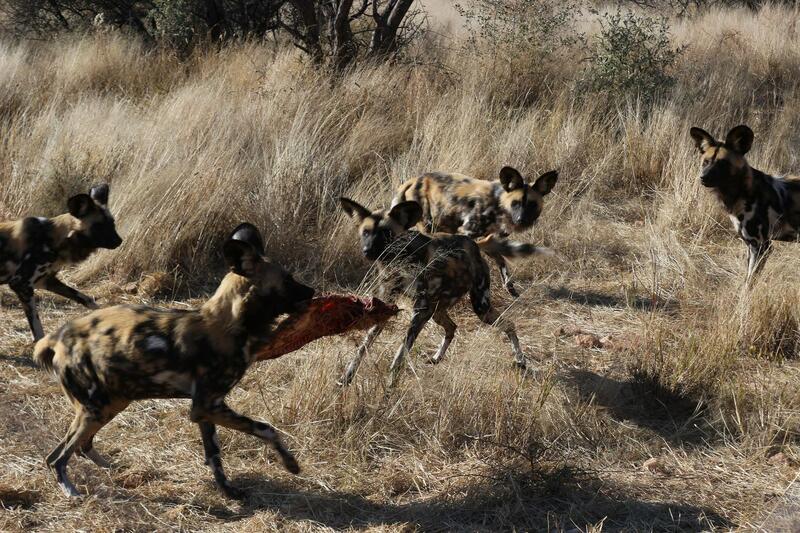 African wild dog packs enjoy a remarkable hunting success rate due to their incredible cooperative hunting methods. Wild dog take social to the next level, not only allowing younger animals to feed first and bringing meat back to pups at the den in their stomachs, but actually also feeding and caring for sick or injured adult members of their pack. This level of care and support is unseen among other social carnivores. A recent study even went so far as to suggest that wild dog packs might be democratic in nature and that they might actually vote on whether to embark on a hunt or not by sneezing! 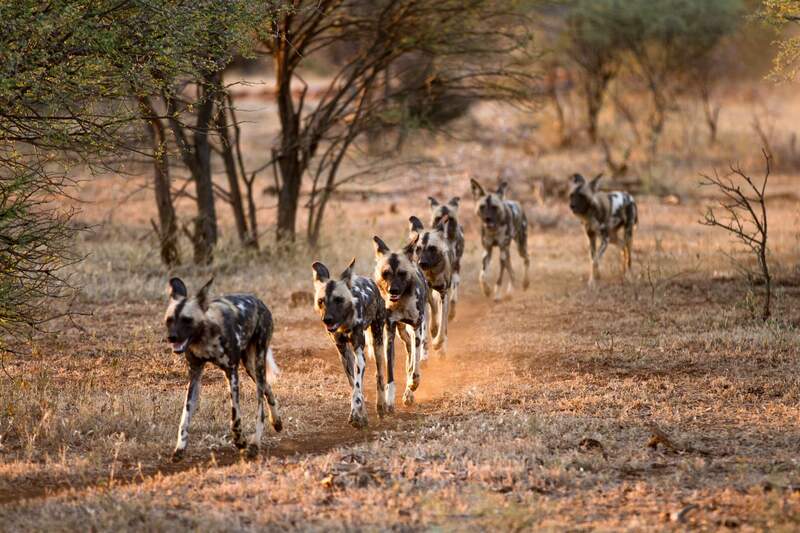 This kind of canine democracy is the first of its kind identified in predator species anywhere, and goes a step further toward illustrating the extraordinary cooperation that exists in an African wild dog pack. They’re incredibly beautiful animals, with a huge amount of variation in their colouring and markings, with each dog’s colouring being as distinctive as a fingerprint. An encounter with a pack of wild dog in the wild is one of the most special experiences you can have in the African bush. There’s nothing quite like encountering a pack of wild dog in their natural habitat. 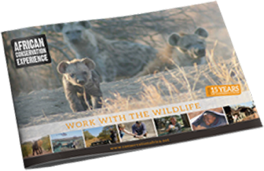 How can I contribute to wild dog conservation with ACE? Our volunteers are able to contribute to African wild dog conservation through a number of our projects. Our Game Ranger Experience project in the Greater Kruger National Park is based in an area with significant wild dog activity. Sightings are fairly frequent, which means that there are often opportunities to monitor their movement and behavior, and as a volunteer on this project you’ll also be a part of conserving this part of their range in the area, which is a crucial part of wild dog conservation given the very large areas they require to survive. 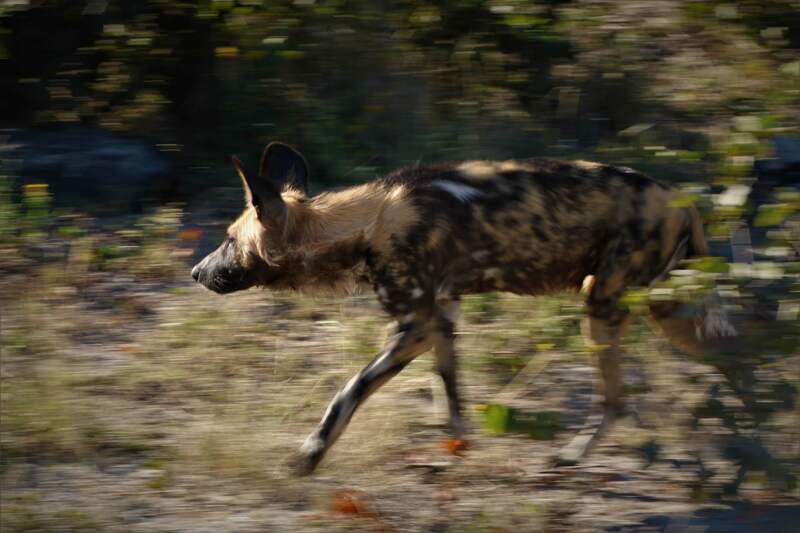 Our Okavango Wilderness Project, based in one of the African wild dog’s greatest remaining sanctuaries, offers ample opportunities to encounter wild dog in their natural habitat. Several packs move around the vicinity of the study area, and as a member of this project you’ll contribute towards recording their numbers and movements through sightings and spoor surveys. As with our Game Ranger Experience, you’ll also help to ensure the continued conservation of these critical areas, which form part of one of this species’ most important remaining habitats. Another key wild dog conservation area is Namibia, where numbers have historically been relatively low but stable. As numbers have fallen across the rest of the continent, the 300 – 600 individuals that call Namibia home have become increasingly important, making up between 5-10% of Africa’s entire population. Our project in Namibia, the Magetti Wild dog and Elephant Protection Project, is specifically focused on wild dog conservation. As a volunteer on this project, you’ll be involved in reducing conflict between the area’s wild dog population and local livestock farmers, thereby helping to ensure that this important African wild dog population continues to be able to survive.